Sabath Anthony Mele was on born January 21, 1922 in Astoria, New York. He eventually earned the nickname "Sam" due to his initials. Both of Sam Mele's parents were born in Avellino, Italy in the Campania Regional. In the Soprano's Tony Soprano claimed his family was also from this town. Although from the same town, Sam Mele's parents both met in America. In Astoria New York, Sam's father; Antonio worked for the Con Edison Company. His mother was sister to big league brothers Al & Tony Cuccinello, making them Sam's uncle's. One time when he was a kid he had gone hit less during a weekend of playing baseball, he went home & threw his uniform on the ground saying he was through with the game. His mother chewed him out about being a quitter, then she told her big league brothers who gave it to him even worse. He came home a few days later to find a noose hanging from the ceiling, they said if your going to quit, you should just hang yourself. Mele remembers meeting Babe Ruth once at a Bayside Country club, as well as Hall of Fame Manager: Al Lopez, who were both friends of his uncles. Mele attended Bryant High School off 31st Street in Long Island City, moving on to New York University in Manhattan’s Greenwich Village. Mele was a star basketball player at NYU, and went to school on a scholarship. He then served the United States in World War II with the Marines for almost three years. The six foot one right handed hitter, was signed by the Boston Red Sox in 1946. He had been lucky enough to work out with the Red Sox due to the fact his NYU coach was friends with a Red Sox scout. There he learned a little about about hitting from Ted Williams. He went on to lead the Southern League in hitting (.342) as well as triples (18) that same year. The next year he was in the majors, batting .302 with eight triples posting the AL’s second best fielding % in the outfield (.992). He played in an outfield next to Ted Williams & Dom Dimaggio before losing his starting job to Sam Spence in 1948. That year his average fell to .233 & he was traded to the Washington Senators in 1949. In 1951 he led the league in doubles (36) driving in a career high 94 runs batting .274. He would have one of the league’s best fielding percentages for four straight years in the outfielder during the early fifties. 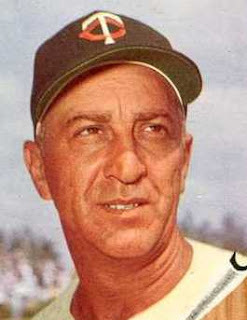 As a right fielder Mele led the league in fielding four times ( 1947, 1951-1953). He led the league with ten assists & had a career high 14 assists in 1953. 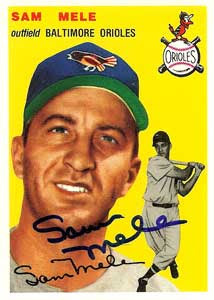 Mele would play next for the Chicago White Sox (1952-1953), Baltimore Orioles (1954-1955), Boston Red Sox again (1954-1955) & Cincinnati Reds (1955) before finishing his career in 1956 with the Cleveland Indians. In a ten year career he batted.267 with 406 hits 80 HRs 168 doubles 39 triples 544 RBIs & a .328 on base % in 1046 games played. Retirement: In 1959 he began to coach under former Brooklyn Dodger & future Mets coach Cookie Lavagetto with the Washington Senators. In 1961 the Senators franchise moved to Minneapolis & became the Minnesota Twins. In June, Lavagetto took a leave & eventually left the position for good. 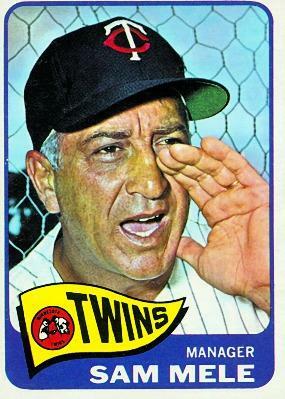 Sam Mele took over as the Twins new manager, finishing in seventh place. The Twins surprised people finishing second the next year & after two poor seasons became one of the AL’s most powerful teams. In 1965 Mele’s Twins won the pennant & fell one game short of winning the World Series when Sandy Koufax defeated Jim Katt in Game #7. That year he was involved in a an incident with home plate umpire Bill Valentine. The usually mild mannered Mele's hand apparently hit Valentine's jaw, he was fined $500 & suspended five days. Mele’s team won 102 games, still a Twins record & won the Manager of the year Award. Members of that great team include Hall of Fame slugger Harmon Killebrew, batting champion Tony Oliva, 1965 AL AVP Zoilo Versalles, Don Mincher & pitchers Jim Katt, Mudcat Grant & Al Worthington. The next seasons the Twins finished second to Baltimore & expectations were high for 1967. In mid May the Twins were just at .500 even though they had acquired pitcher Dean Chance & added rookie Rod Carew. Mele was fired & replaced by Cal Ermer. 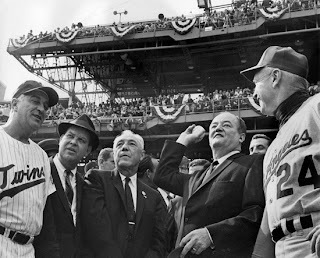 The Twins finished second to the Boston Red Sox losing out on the pennant on the last day of the 1967 season. Mele did not choose to manage again, he went on to scout for the Boston Red Sox into the middle nineties, before retiring. 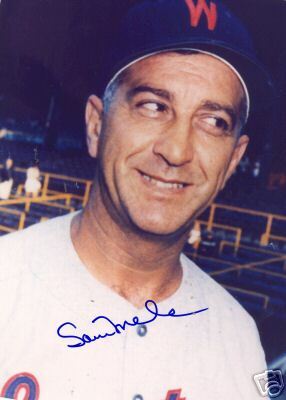 Trivia: As of January 2016, Sam Mele is the oldest living manager to have won a pennant.